Day 2 assembly really focused on the frame of the RigidBot, and the electronics. With the case for the main board installed on the bottom frame, the board itself is installed. 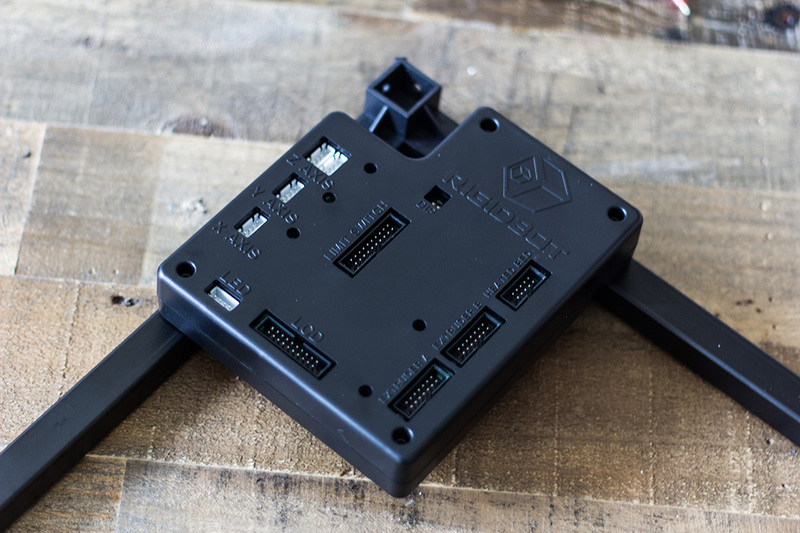 During the Kickstarter campaign, all of the main boards had to be reworked due to an early design defect. There were multiple factories that performed the rework, and as you can see in the photos, I received a “red wire rework” board done by one of the Chinese factories. 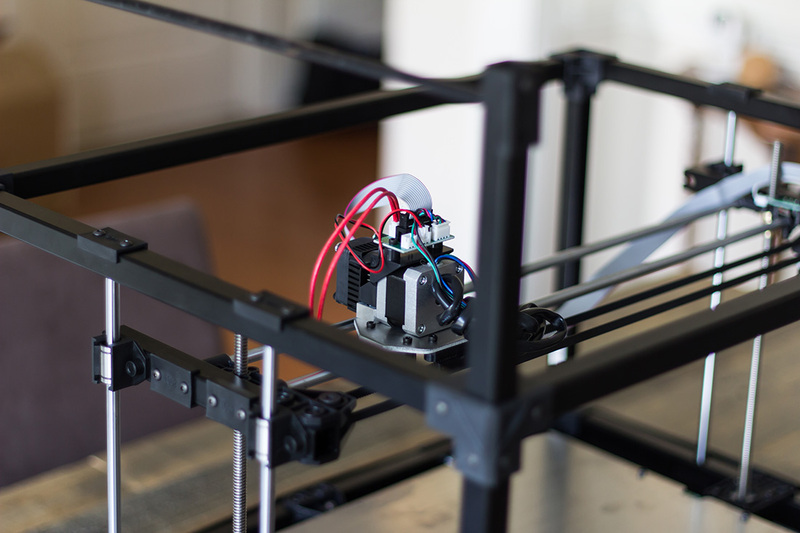 With the frame assembled, the next step was to install the z-axis motors. I had opted for the z-rod upgrade on offer during the Kickstarter campaign. 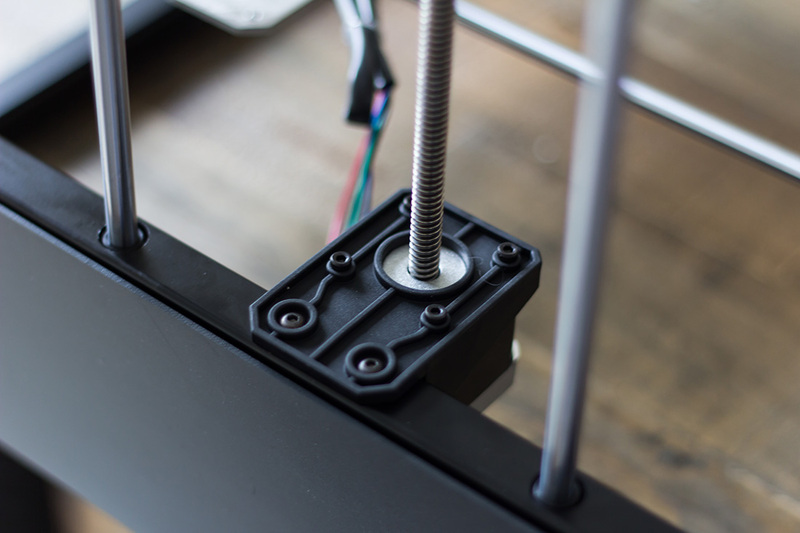 The standard design utilizes normal stepper motors connected to a coupler, which connects to the worm gear of the z-axis. 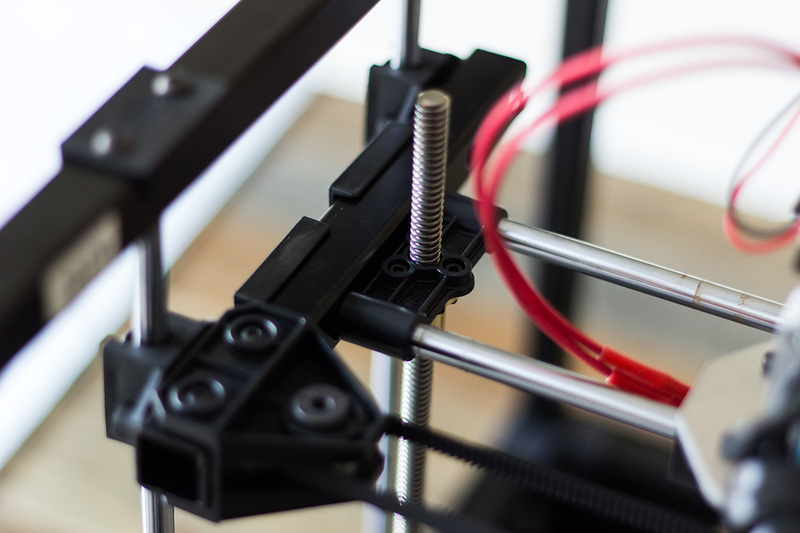 The z-rod upgrade replaces this “coupler-based” design with an integrated stepper motor and worm gear. Attaching the motors and their mounts to the frame was super simple. All of the holes lined up perfectly, and everything just sort of fit together. The heated bed was simple to assemble. 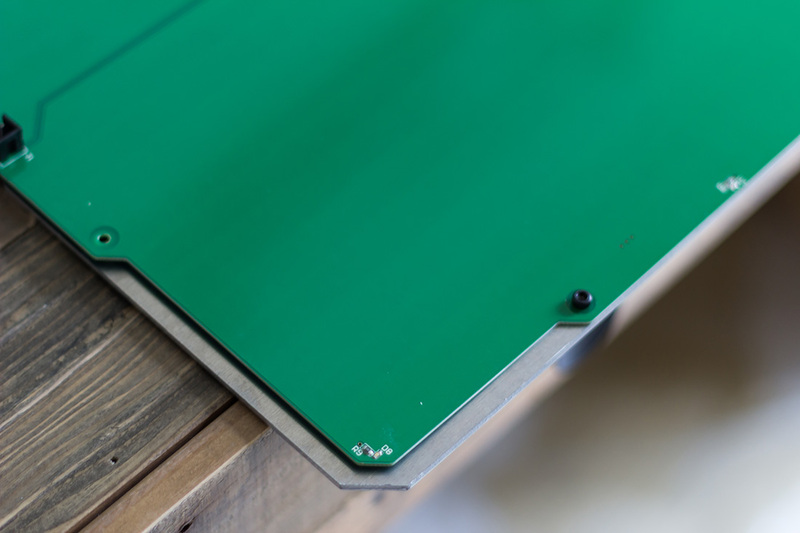 There were several complaints in the community about warped build plates, and heated bed PCBs with nicks and scratches. Fortunately I had none of these problems, and the bed went together easily. Getting the x-axis/gantry installed is a little tricky, since it requires turning the z-axis to pull the gantry down. 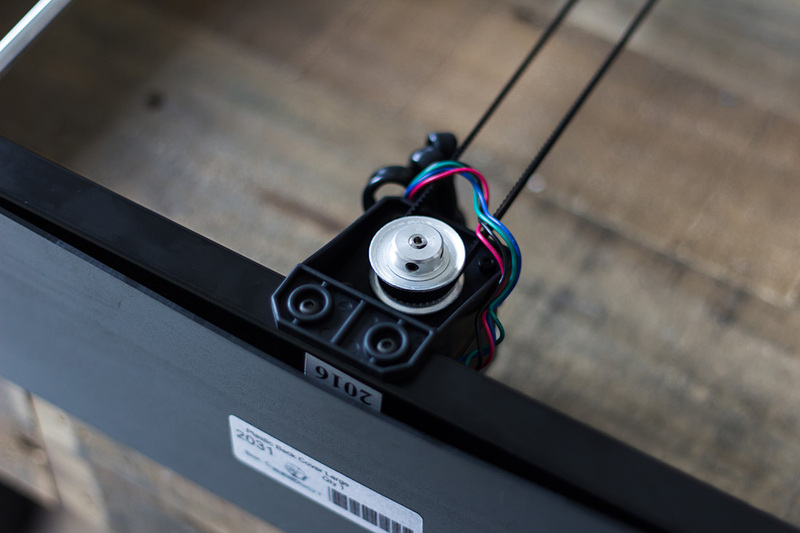 While it wasn’t mentioned in the instructions, I would recommend doing this before connecting the z-axis motors to the main board. 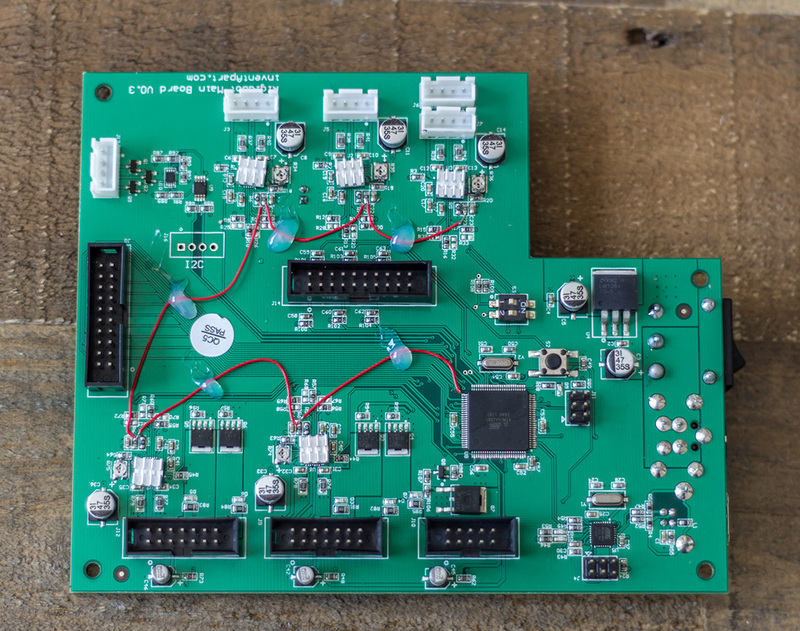 Stepper motors will act as a generator when turned with enough RPMs, and this can damage the electronics in the main board if you’re cranking away on the z-rods to install the gantry. One of the more disappointing elements of the RigidBot is the cosmetic panels installed on the sides. 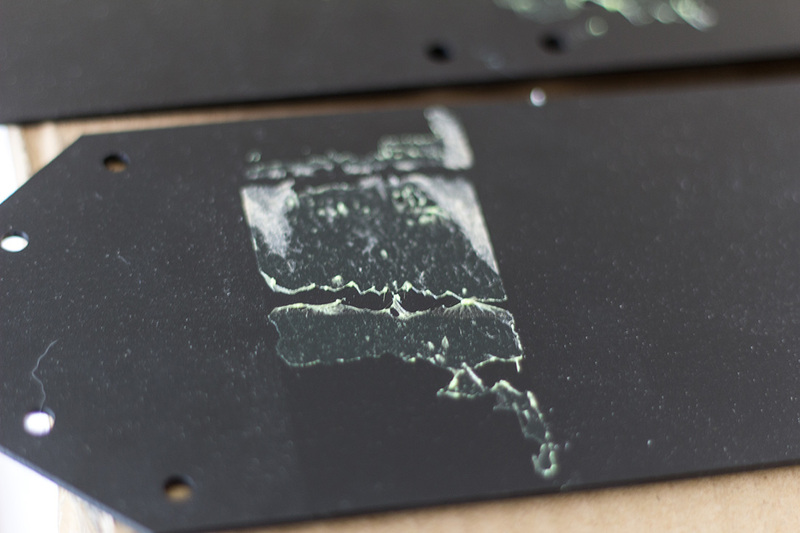 If you ordered a kit, you found that these panels arrived sandwiched together and taped with some sort of an industrial membrane tape that’s incredibly difficult to remove. If you don’t have a bottle of Goo Gone laying around, you will most certainly need one. Once you finally get the panels cleaned up enough to install, you then discover that they really don’t fit well. The design itself is great. Each of the knuckles has an inset where the side panel should rest, and everything is predrilled to just go together. 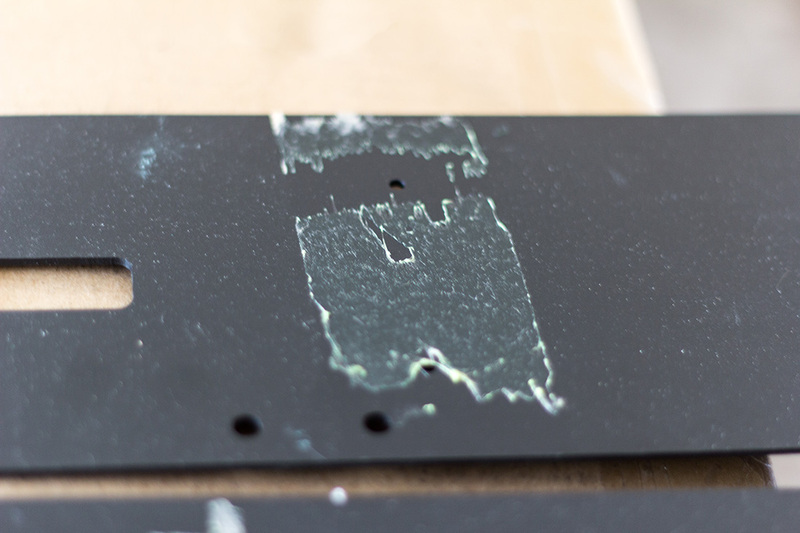 Unfortunately, the panels themselves have horrible tolerances, and you have to drill out or elongate the holes on most of the panels in order to make them fit nicely. 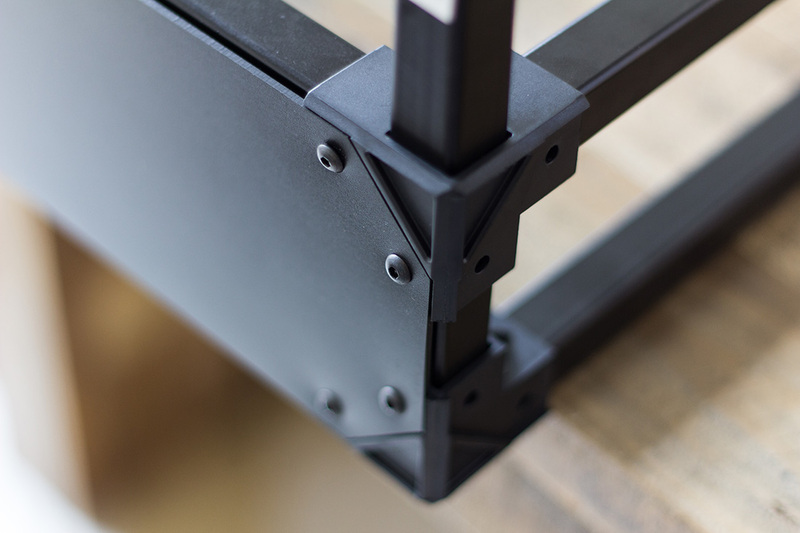 Here you can see the bowing in the panels on the front and sides where the poor tolerances prevent the panel from sitting flush with the frame. Once I completed assembly, I went ahead and spun everything up for a test print. I did manage to get a couple test cubes in and a couple small prints, before I committed to replacing the stock power supply. The power supply that ships with the RigidBot is of pretty poor quality. 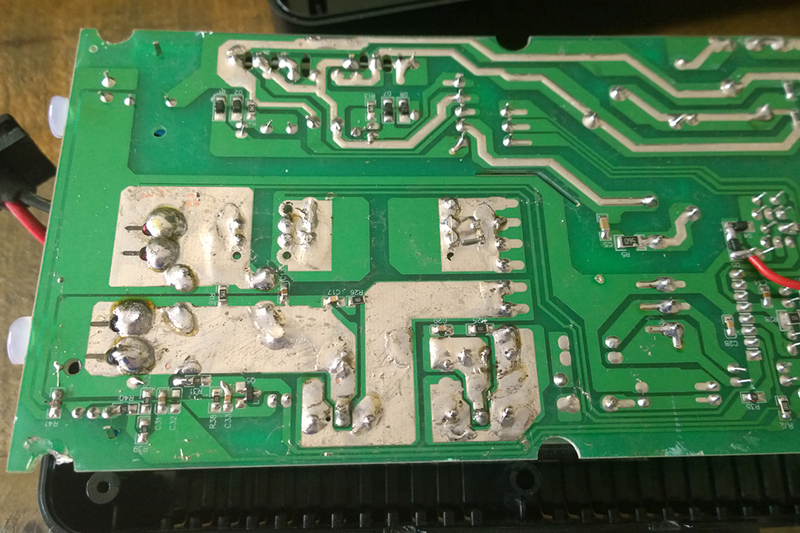 There have been a lot of reports of power supplies failing, and potentially damaging the electronics of the main board. I chanced it for a while until there was a report in the community of one bursting into flames, at which point I decided to go ahead and replace it with the Mean Well SE-450-24 referenced in the community wiki. 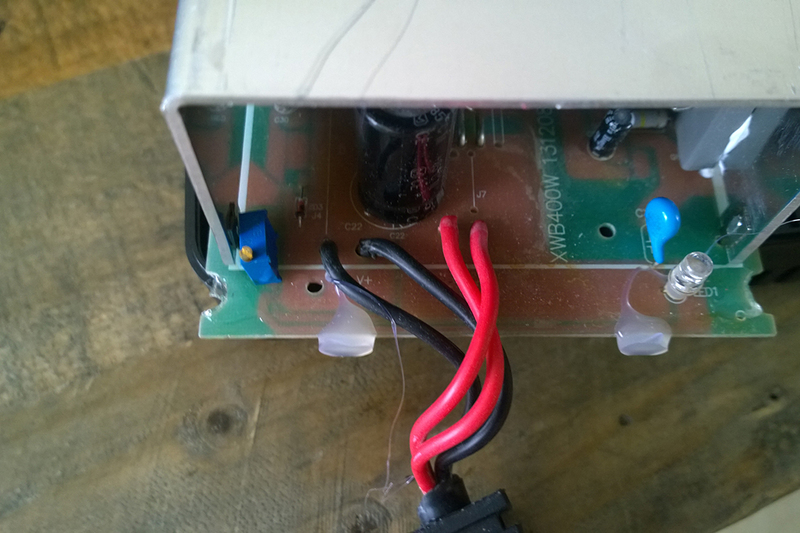 When I removed the cover of the stock RigidBot power supply, I found some of the worst solder work I’ve ever seen. I definitely wouldn’t trust this power supply now. With the new power supply installed, the RigidBot is back up and running. 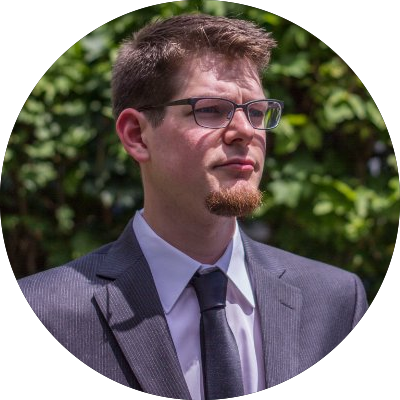 Next up, we’ll talk about calibration of the RigidBot.